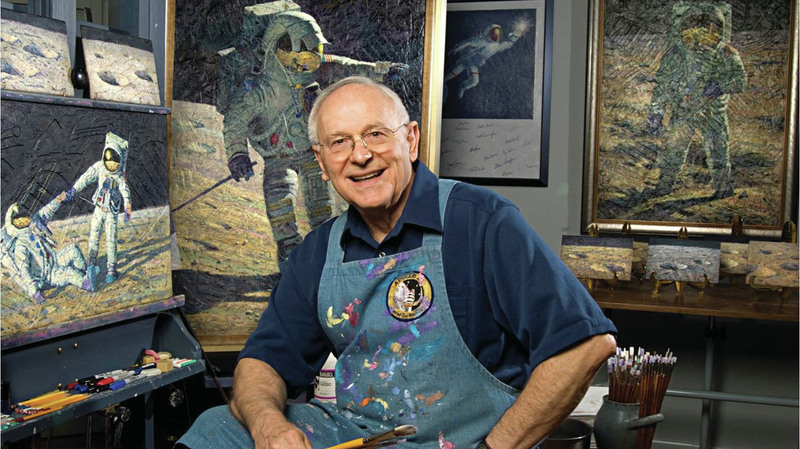 Former astronaut Alan Bean became a painter, re-creating what it was like to be on the moon, using actual moon dust and ground-up remnants of Apollo spacecraft. Bean spent 31 hours on the moon, collecting samples and deploying several experiments with mission commander Charles "Pete" Conrad Jr. They also checked up on Surveyor 3, which had landed two years earlier. Astronaut Alan Bean was photographed by Charles "Pete" Conrad Jr., who is reflected in Bean's helmet visor, during the Apollo 12 moonwalk in 1969. They were busy, but, as Bean recalled during a 2016 NPR interview, "as I ran along, I remember ... saying to myself, 'You know, this is really the moon. We're really here. ... That's the Earth up there.' And I said it two or three times to myself." With Bean's death, only four moonwalkers are still alive — Buzz Aldrin, Dave Scott, Charlie Duke and Harrison "Jack" Schmitt. After Apollo, Bean commanded the second Skylab mission in 1973 — orbiting the Earth for 59 days. Later, he was in line to fly the first shuttle flights. But he gave it up because "the more I thought about it, the more I realized there were young men and women at NASA in the astronaut office that could fly the shuttle as good as I could or better, but I was the only one interested in trying to do this other job." That other job was to paint. So he left NASA. He had an engineering background and was a test pilot in the Navy, but he took art lessons at night. It was something he always wanted to do full time. 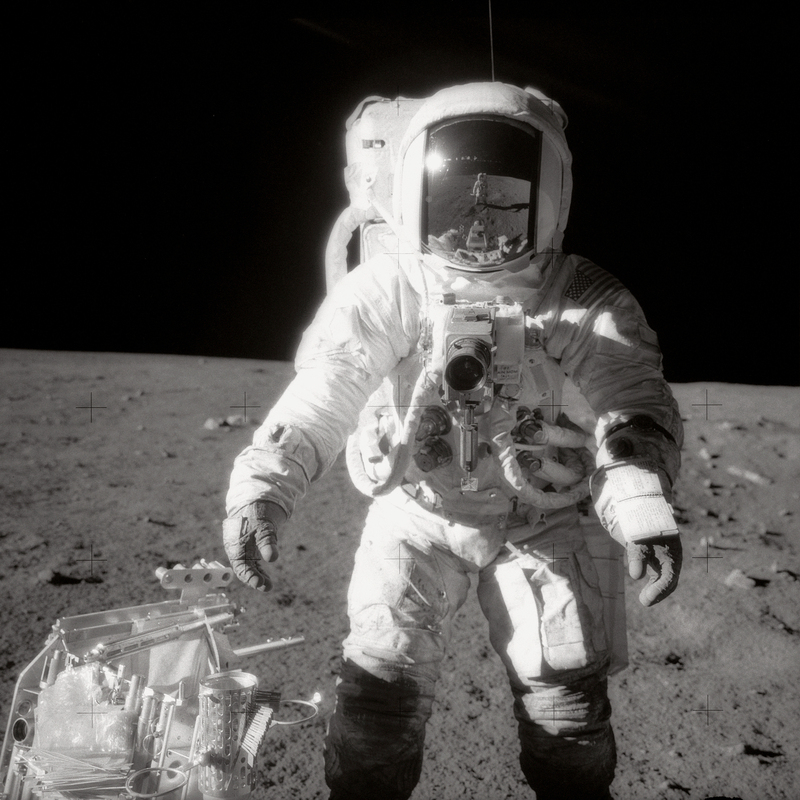 For more than four decades after his space career, he chronicled the six missions that landed on the moon. He said, "I feel blessed every day when I'm working on these paintings ... the first artist to ever go to another world and try to tell stories that people care about." In painstaking detail, he re-created what it was like to be on the moon, using actual moon dust and ground-up remnants of Apollo spacecraft. Before starting each painting, he would spend weeks studying photographs and videos, and calling fellow astronauts to probe their memories. Those materials and memories are what Bean brought back from the moon, but he also left something behind — his silver astronaut lapel pin. He had thrown it as far as he could into a crater. He said he thought about it often, "and when I look at the moon at night, [I] think about that pin up there, just as shiny as it ever was, and someday maybe somebody will go pick it up."